The hardest thing about following your intuition is distinguishing which thought came from your intuitive mind and which came from the thinking mind. I get a lot of questions, but knowing your intuition from your other thoughts is one of the most common so I know it’s a real sticking point for people. To identify your intuitively inspired thoughts you ought to know what intuition is and where it comes from. Intuition is information that spontaneously appears in our awareness without any conscious effort on our part. Intuition is our own inner wisdom and guidance. It is a small voice we hear often like a whisper, that gently nudges us to make the right choices and decisions in our lives. It can tell us when we should be wary of a person or warn us against doing something and when we should act on an opportunity. It comes to us spontaneously and many times feels like an “aha” moment. Intuition can also be the sense you have that someone is staring at you or walking behind you, before you even turn around and meet their gaze. In this application intuition is a sensory experience about the environment around you. It’s no different than the other five senses we rely upon – it’s just more subtle which is why some people are not aware of it. Intuition makes you “feel good” about doing something. You will experience a sense of “certainty” about it. The matter will feel “settled.” It will feel right and give you sense of connecting all the dots. Always go back to how this “voice” makes you feel. Once the answer comes to you, if it came from your intuitive mind you won’t have any lingering doubts. You’ll trust it and feel sure and, you’ll feel it directly in your gut. It’s only after we screw up by ignoring our intuition that we admit that we did in fact, “know.” Before we are forced to admit it, we’ve usually been in denial with our heads in the sand pretending everything was going okay. Does this sound familiar? Rationalizations are akin to lies we tell ourselves to make things “okay.” Rationalizing is not “real” therefor it has no weight, no real substance and cannot make your gut feel as if you are standing on stable ground. When our intuition gives us an answer we don’t like our ego tries to confuse us by making us doubt our intuition. When you don’t like the answer you got usually it’s because you haven’t yet assimilated the lesson you need to learn from the situation that you’re looking for answers about. Intuition is often a “shortcut” to answers you need so, if you ask for intuitive guidance you’ll get the answer whether you’re ready to act upon it or not. When a thought comes from the ego, often you’ll feel as if you “should do” it. You’ll be aware of your rational mind recounting the reasons why you ought to do it – why it “makes sense.” Keep track of the “yeah buts” that’s a big clue that you are rationalizing. If you feel the voice is advising you to do something out of fear, or lack or that you should do this over that – it is NOT your intuition. This is the clearest way to know the difference. It is never our intuition that is wrong but, what we mistake for our intuition. They key is your gut. You’ve got to feel it in your gut. If you don’t feel it in your gut it’s not your intuition – it’s your mind rationalizing. Keep this in mind and you’ll distinguish between your thoughts and your intuition. Do you have any other questions about identifying your inner wisdom? What specific incidents do you recall in your life where you questioned your intuition? Share with us in the comments. If you enjoyed this post please share it on Google+, Facebook & Twitter. Thank you. P.S. 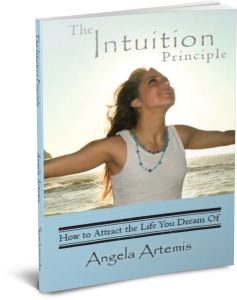 To learn more about how to know your intuition from your thoughts pick up any of my books here. Want to “Pin” this quote? Sure – go ahead! Why Can’t You Hear Your Intuition? Why can’t you hear your inner voice, AKA your Intuition? I get a lot of email from subscribers asking me why they can’t hear their intuition loud and clear. So today I’m opening up the PbI mailbag once again to address this frequently asked question. 1. The first thing you need to understand about Intuition is that it’s quite subtle especially when you first begin to work with it. It presents itself in very “ordinary” ways that can easily be overlooked. 2. You have the power to turn up the volume of your intuition and to mute it as well. You are always in control….even when you feel as if you’re not getting the answers you desire. Most likely you’re getting the intuitive information you’ve asked for but, you’re suppressing this information. More on this below in #4. 3. Developing intuition is like any other thing we set out to accomplish in our lives; our intention is key. You must create the intention of hearing and then following your intuition in your life if you wish to hear it loud and clear. 4. Another factor you need to understand about your Intuition is that when you’re attached to the outcome you will unconsciously suppress this information from your mind if it conflicts with the outcome your desire. 5. The last thing on this list you must absolutely understand is this: Human Beings can rationalize and justify almost anything if there is a reason to do so! Read the following two examples and this will become very clear. You decide the doctors must be right, that it must be all in your head and take your meds and go about your life. As the symptoms persist you can’t shake the feeling in your gut that something is wrong. You rationalize it away though by thinking that it’s just fear talking and not a real health issue. Months later you have a seizure and an MRI reveals a serious problem in the brain. You realize that you let yourself override your intuition because you rationalized that you couldn’t possibly know more than the medical establishment. You meet a new love interest and start living together. You get along well and enjoy a really nice lifestyle together. You love to travel together and enjoy many of the same interests. This person is head over heels in love with you but you don’t feel the same although you care for them a great deal. Eventually, they start talking marriage. Your friends and family tell you that this person is really great and how lucky you are to have found each other. They point out all the good qualities the person has and you can’t disagree either….they are a really exceptional person. The problem is that you can’t make up your mind what to do. You get stuck in an endless loop of considering how “lucky” you are to have this person in your life and how wonderful all your friends and family say this person is. Yet something holds you back from jumping into the marriage. You finally say yes and get married. Two years later the marriage is over. You now realize the reason you held back from jumping into the marriage was because you were never in love with your partner in the first place. This person “checked off” all the boxes on your ideal mate list except the one about being in love! You settled and talked yourself into it. 1. Journal. It’s easy to get in touch with your feelings when you journal. I wrote about this extensively in my book, “The Intuition Principle.” Journaling is a safe place to reveal your true feelings. Writing will also help you organize your thoughts and sort out what you believe over what society has imposed upon you. A good way to get to the bottom of your own feelings is to write out the question you want an answer to at the top of the page then just start writing without censoring yourself. When you feel that sense of completion – stop. Go back to read what you’ve written and you will be amazed at the wisdom that has poured out of you. 2. Meditate. When you make the time to get quiet every day your intuition will get louder and clearer. The busyness of every day life is distracting. You must create an empty space in the mind where your intuition can come through. Find a quiet and private place where you can close your eyes for 15 to 20 minutes without being disturbed. Focus your attention on counting your breaths until you reach the number 50. At the 50th breath notice how you feel. Your thoughts should have slowed down. You should feel alert yet relaxed. Try to remain in that state. If your mind begins to race go back to counting the next 5o breaths. These relaxed moments where your thinking has slowed down is where your intuition will begin to come through. Ask a question you’d like guidance on then sit quietly and listen. 3. Take back your power. Realize that if a feeling or thought persists it persists for a reason. If you feel in your gut that you’re not okay with the diagnosis from your doctor get another opinion. If you hesitate to make a decision even if everyone you know says it’s right, there is a reason. Don’t go along with the what other people think if you have a nagging thought or feeling that you should do something different. The truth is we’re raised to listen to authority figures but that doesn’t mean they’ll be right every time. Where have you overridden your intuition in your life? How did it turn out? What will you do differently from now on? If you enjoyed this article please share it on Twitter, FB & G+. Thank you. P.S. Learn to clearly hear your intuition: Click Here. Have you ever made a decision based on a fear that if you didn’t do this one thing you’d miss out on something? If you relate to this story you might be making this mistake too. A coaching client* mentioned that she was having doubts about a man she was in the early stages of a relationship with. This lovely woman was divorced and happy to be free from a terrible marriage. After her divorce she moved clear across the country to get as far away from her ex as possible. She loved her new home, neighbors and job and met a nice new man not long after moving. Things seemed to be perfect at first. He was a widower with several grown children living near the Gulf Coast. He loved his family and spoke about how close they all were. They had many interests in common and he was respectful and took things slow which my client appreciated. He was worldly, having traveled to many different countries and had many stories to share. He loved the opera and the arts and volunteering at charity organizations. She was in heaven! Who had sent this angel of a man to her? Since meeting him she had been coaching with me to find her life purpose. She wanted to create a new life that she loved now that she’d escaped her unhappy marriage. During our sessions she’d been updating me on her progress with him. Every session she asked me if I got any “vibes” about him. I got the feeling that he was hiding things from her and that he wasn’t what he appeared to be. I also got a strong feeling that she should be very cautious with him. As it turned out one day he picked up and moved to the Gulf Coast. He told her via text that he missed his children and decided to move back to where they lived. She was disappointed but, I was relieved. She attributed his inability to be open and share with her as a sign of caring for her feelings. She believed he had been planning on moving back to where his children lived for some time and that he hadn’t told her to spare her feelings. I saw what he had done as devious and very controlling. He toyed with her and then left her flat. I didn’t like the vibes I got from that at all. A few weeks later she told me that she’d been texting with him since he moved. He wants her to come and visit him but not right now……he is quite busy, he says, because the g-men are after him. Years ago he got into trouble with the law and ever since he has been hounded by the government so, he has to keep a low profile and keep on moving and cannot even see his children. “So, then why are you considering keeping the lines of communication open?” I ask. What was happening was that my client was afraid that she was going to miss out if she let this guy go. She was letting her fear and belief in lack override her intuition – which was right on the money. Instead of believing in herself and her worthiness and that there are plenty of fish in the sea she is holding onto to this one stinky fish! She knew what her gut was saying was true all along or she wouldn’t have kept asking me what my vibes were on this guy. She didn’t want to be right. If she was right she would have to walk away from someone who was paying attention to her. See how we deceive ourselves when we make the #1 mistake that blocks our intuition: Fear missing out on something? 1. Get clear on why you want what you want. Ask yourself if you’re attached to the outcome? If so why? 2. Trust your gut. It always knows! If you feel something is amiss it is, whether you can prove it or not. That’s your spidey sense. 3. Never do something because you fear that if you don’t you’ll miss out and never get another chance. When we make any decision from a place of fear instead of confidence and strength our judgement is compromised. How have you been blocking your intuition by being afraid you’ll miss out. Is it really true? Will you miss out? Share in the comment section. If you enjoyed this post share it with a friend on Facebook, Twitter or Google+. P.S. 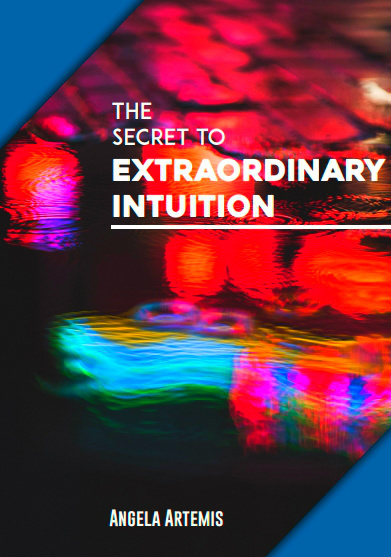 Hone your intuition – click here! *The client’s personal details have been changed to protect her privacy. It’s time to open the Powered by Intuition mailbag to answer readers’ questions about intuition. I love to hear from readers. They ask the best questions. And, I know if one person asks me something there are countless others who have the same questions who will benefit from the answer. Question 1. I was doing some research and came across your article, “13 Signs You May Be a Medium.” I’ve experienced 9 out of the 13 signs you mentioned. I’m constantly seeing images in my head even with my eyes open. I see clips of random peoples lives sort of like a short film. My mom passed away last year and I knew she was going to pass away weeks before it happened. I have had an out of body experience that scared me to death! Sometimes I’ll go to, for example, a “please touch” museum. I will reach out to touch an item and a electrical rush or tingle soars through me numbing my entire body and sort of blacking me out. Also people drain me I’m always told that I give great advice so they all bring their problems. The thing is I have very bad anxiety and am taking on others energy positive or negative. I would love to control and better understand my ability so I can live a more relaxed life. Please help! Answer:If you are seeing images in your mind’s eye you are a clairvoyant. Seeing snippets of people’s lives as if watching a short scene from a movie is exactly what it feels like. I’m so sorry about the loss of your mother. It’s so difficult to lose a parent no matter how old you are. All your psychic channels are opening. I used to have many spontaneous out of body experiences when I first started developing too. It’s a common signal that you are ready to begin training in this area. If you touch things and get impressions about them then you are definitely a medium. This is called “psychometry” and it is a method for getting information about the deceased or, previous owner of the item. Most psychics and mediums (not all) are very compassionate and truly want to help others so they tend to be old souls who can give good advice to others. You definitely fall into this category. If you have anxiety from taking on other peoples problems and energy you need to learn to protect yourself. I wrote about this in my book: The Intuition Answer Book. I have a lot good protection exercises in there that you can do. Question 2 .I’ve come to terms with the fact that I’m empathic and I’ve learned so much about it. 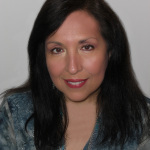 I’ve been able to be centered and present with your Intuition Principle meditation series and your book, The Intuition Principle; thanks so much for your work! My question is this: Sometimes I will be just watching a movie or doing something as mundane as washing dishes and all of a sudden, I find myself getting very cold with goose bumps, or my scalp will just start to tingle. Yes, you are absolutely right about what is happening to you. You are experiencing a moment when you blend with the ALL or Spirit. You are feeling what is called the “cool breeze” of the Holy Spirit and your 7th chakra is opened and merging with this higher vibration. That is where the tingling on the top of the head comes from. If you’ve ever seen a painting of a saint with a halo – it depicts the opened 7th Chakra and union with the divine. If you put your hand over your crown chakra the next time this happens to you – you will be able to feel the energy and coolness. Question 3. I know that I am an intuitive person because it has been proven to me by others not listening to me when I have a bad feeling or vision and advised them against doing something. My problem is that, for some reason, when it comes to me my intuition is backwards or off. If I feel I should choose “Choice A,” I better choose “Choice B” because what my gut says is wrong! Also when something is supposed to happen and I am positive about it, it ends up not happening?? Am I channeling my energy wrong?? I don’t understand how I could save people from accidents and other calamities but for the life of me can’t save myself. When we have a gut feeling or a precognition about something pertaining to someone else we are “removed” from their situation. In other words we can be “objective” and not emotionally involved or attached to the outcome like we are when we are trying to get information for ourselves. When it comes to predicting or asking for guidance for ourselves we doubt and start to wonder whether it out imagination or real. We also know which outcome we prefer so we wonder whether it is our intuition or our wishful thinking. This take practice, learning by making mistakes and building up confidence in our intuitive skills. It won’t happen over night and there will still be times when you will still be wrong about yourself – that is the nature of being human. So don’t be so hard on yourself. That is why when I cannot figure something out for myself I go to another medium or look for signs to validate my decision. I wrote about how to read the signs in my book, “Navigating by Intuition.” Using signs is a great way to alleviate doubt and get confirmation of your intuitive hunches. What questions do you have? Leave your questions in the comments section and I’ll answer them. Share this post with a friend on Twitter, Facebook or Google+. P.S. Find your right path in life by following your intuition. 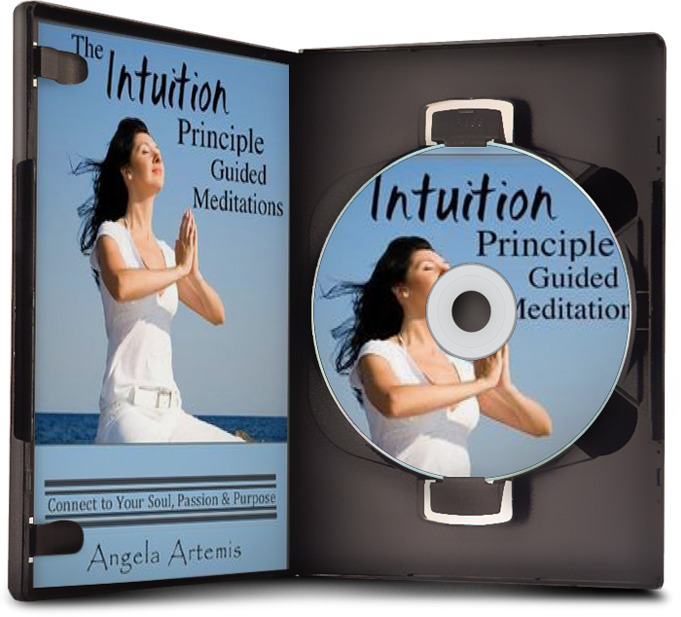 Learn how to use The Intuition Principle: Click Here!